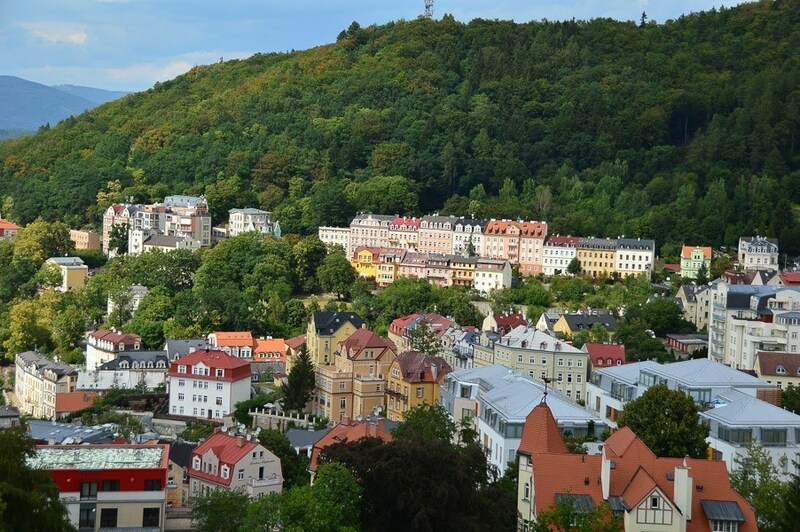 The Karlovy Vary region is the second smallest in the Czech Republic. 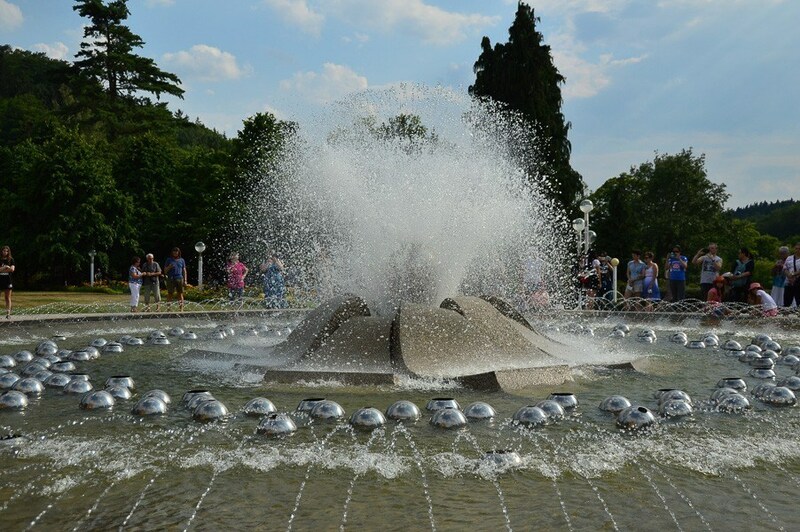 It is filled with natural beauty, castles, chateaus and best of all its famous hot and cold mineral springs. The region can be visited as a day trip from Prague easily. However, to get the most out of it I highly recommend staying for at least a couple of nights. It is tough to relax in a Czech spa town when you only have a limited amount of time. Really relaxing requires times. Plus there are so many interesting and lovely things to do you will want to have the time to experience as many of them as possible. This region became famous in the 14th century for its frequency and diversity of mineral springs – still quite unrivalled in the world today. For centuries the region was visited by royalty and the wealthy from across the world. However, WW1 and WW2, of course, impacted heavily on the area. Under the communist rule, the spas were all nationalised and their popularity diminished. Since the Velvet Revolution of 1989 considerable investment has been made in the region to bring it back to the popularity it deserves. It is a beautiful area and there is considerable evidence of the effectiveness of taking the waters of the region. The region is now making efforts to be declared as a UNESCO World Heritage Site. The closest international airport is Prague. Karlovy Vary has a domestic airport. The Czech Republic has a high quality and reasonably priced bus network. Normally I avoid bus travel but it was very easy and comfortable in the Czech Republic. The same applies to trains. The national railway is Ceske Drahy. For longer distances for both train and bus check out Regiojet (who I used and I would highly recommend), Leo Express and just for buses Flixbus. From Prague to Karlovy Vary there are bus and train options. The bus is a faster and cheaper option. Buses leave every hour and take about 2 1/4 hours. The buses are modern and comfortable and can be booked online here. The train from Prague to Karlovy Vary takes 3 1/4 hours and can be booked online here. 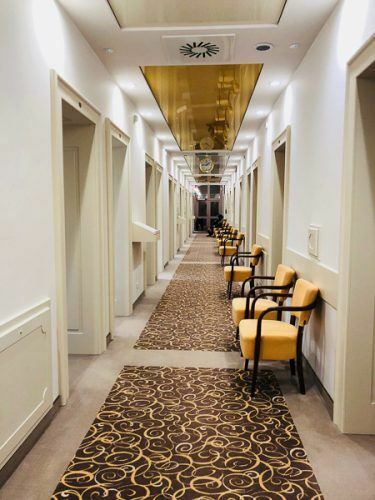 Trains from Prague to Marianske Lazne take about 2 1/2 to 3 hours – book your train ticket online here. 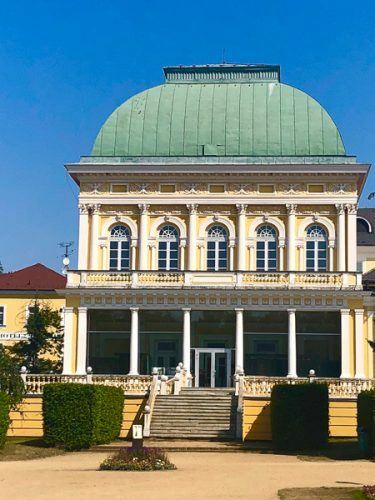 Unlike Karlovy Vary, the train is a better option to Marianske Lazne as the bus takes between 3 and 3 1/2 hours – book your bus ticket online here. Train options from Prague to Frantiskovy Lazne are limited. The bus is the best option – transport times vary between 2 3/4 hours and 3 1/2. Book your bus ticket online here. From Prague to Loket is bus only and takes between 2 1/2 and 2 3/4 hours. Book your bus trip to Loket online here. 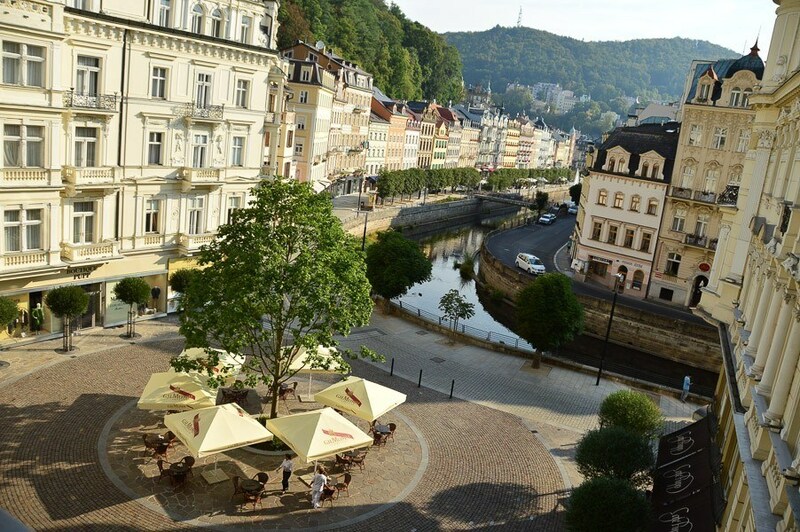 If you are tight on time and staying in Prague the best option is a guided group day trip to Karlovy Vary. 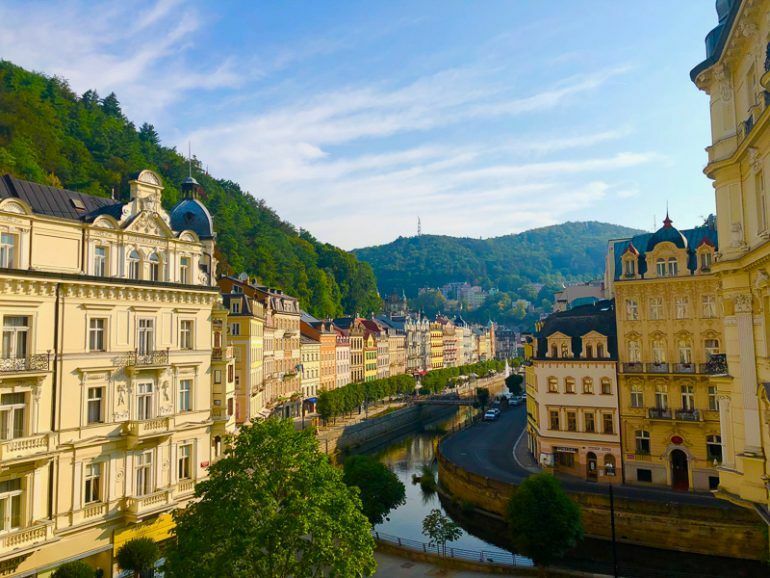 This day trip runs about 10 hours and includes lunch and a trip to the Moser glass factory as well as plenty of time to stroll around beautiful Karlovy Vary. There is quite a bit of variation across the year as to which days they run the tour so make sure you check ahead of time. 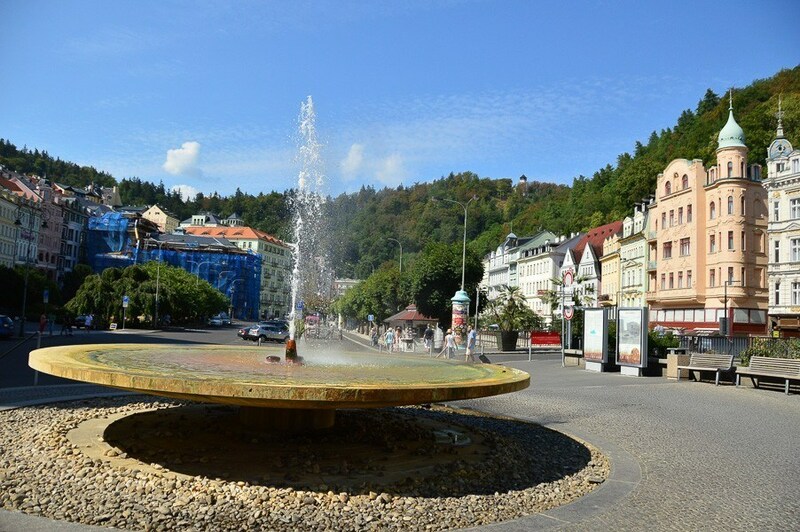 Or if you’d like more flexibility then why not book a guided Private Day Trip to Karlovy Vary? 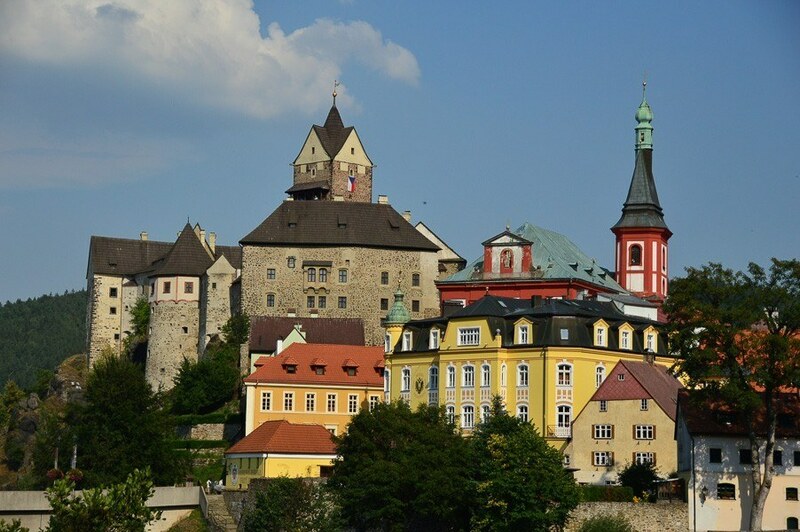 or add in seeing the stunning town of Loket and its beautiful castle alongside Karlovy Vary in this Spa and Castle Private Day Trip. Or visit both Karlovy Vary and Marianske Lazne in this Czech Spa Day Trip from Prague. 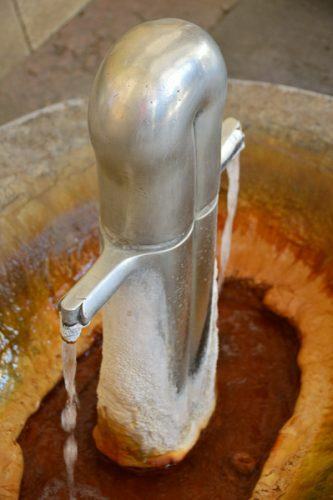 On this tour, you’ll visit both towns and try their springs and it includes lunch. Travel by bus and also visit the Tepla River. 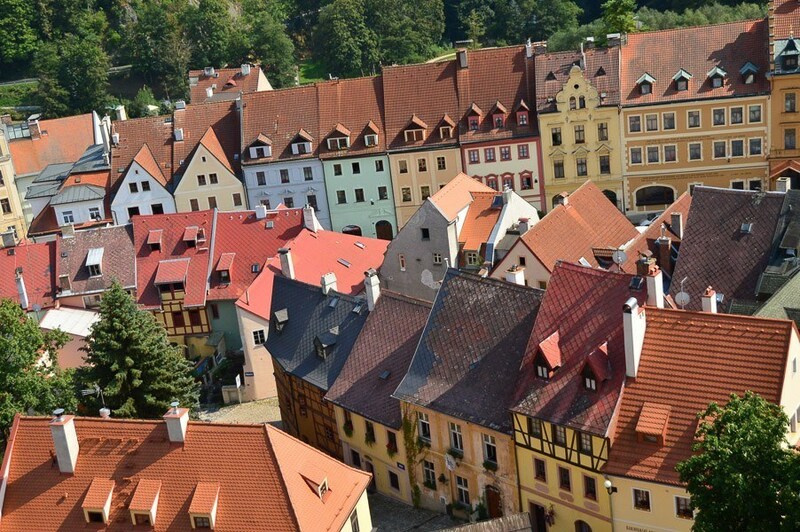 For the ultimate in ease and flexibility book a private transfer to Karlovy Vary. 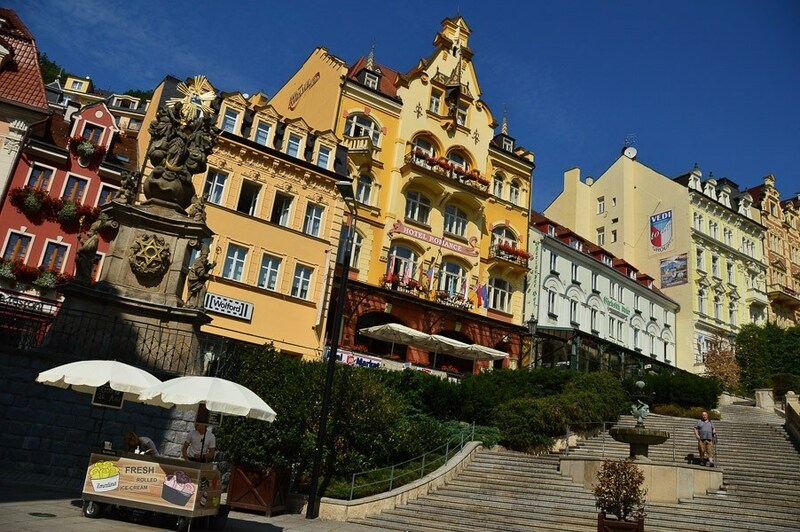 You’ll be taken to and from Karlovy Vary in a private comfortable vehicle and be able to explore the town in your own time. 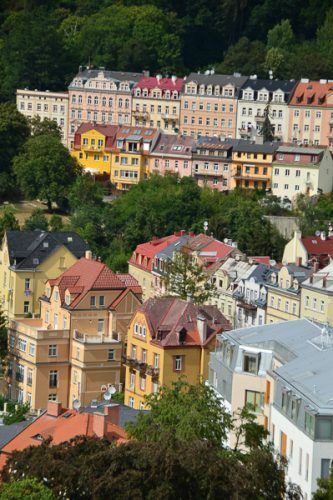 Karlovy Vary is the most famous spa town in the Czech Republic. The town has been treating visitors for more than 650 years. However, it was in the 18th century that the town began to develop and become known across Europe. In addition to its famous Springs, the town itself is very picturesque and also the home of one of the world’s leading film festivals in July each year. 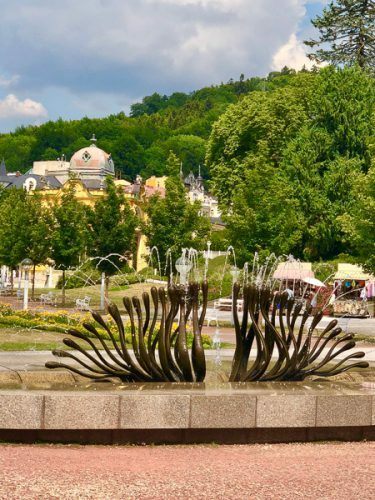 There are 79 different Karlovy Vary Hot Springs. Fourteen of these are currently used for drinking. The hottest one is 72 degrees. Depending on your ailment/s your doctor will prescribe you to “take” the waters from different springs at different times. Each hot spring has unique properties. The Karlovy Vary thermal water is unique in its physical and chemical properties. 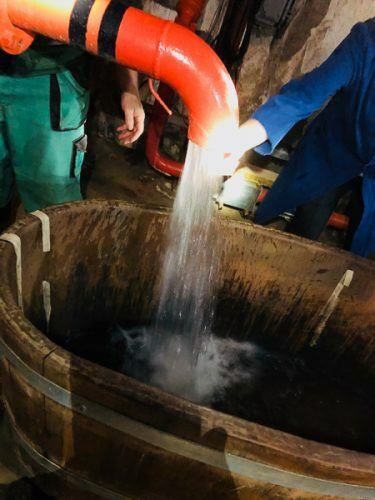 Essentially the waters here contain larger amounts of major and minor mineral elements than the water you drink at home. Some of the minerals in the waters are up to 30,000 years old! This is what provides the healing element. Drinking the waters is compared to an “inner shower”. It washes out the stress. The main illnesses that are treated are those of the digestive tract, metabolic disorders and those of the musculoskeletal system. 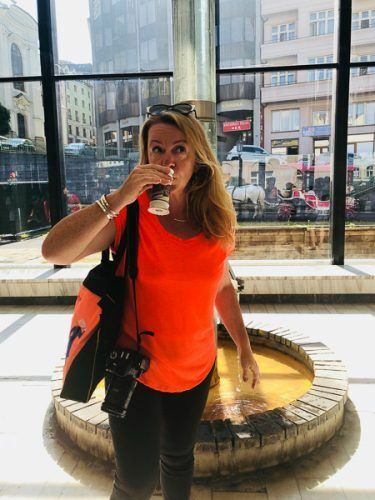 The drinking cure involves literally drinking the waters 40 minutes before breakfast and then a further 200ml before dinner. Generally, patients drink about half a litre of the mineral water each day. This is combined with baths and massage. 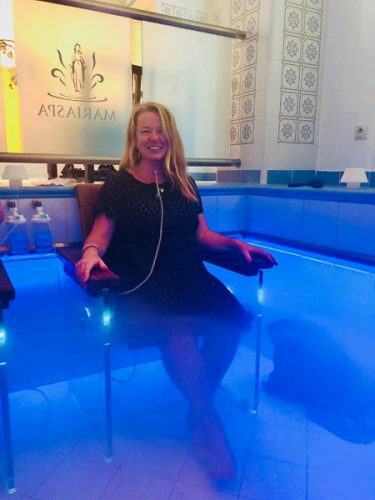 There is also electrotherapy and even inhalation of fine sprays of the waters. However, it does take at least three weeks of taking the waters to see an effect. 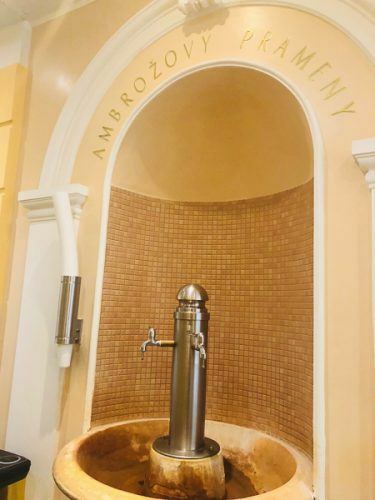 It is not just the waters that contain health benefits in Karlovy Vary. The mountain air is excellent and there are many places for walking, hiking, cycling etc. 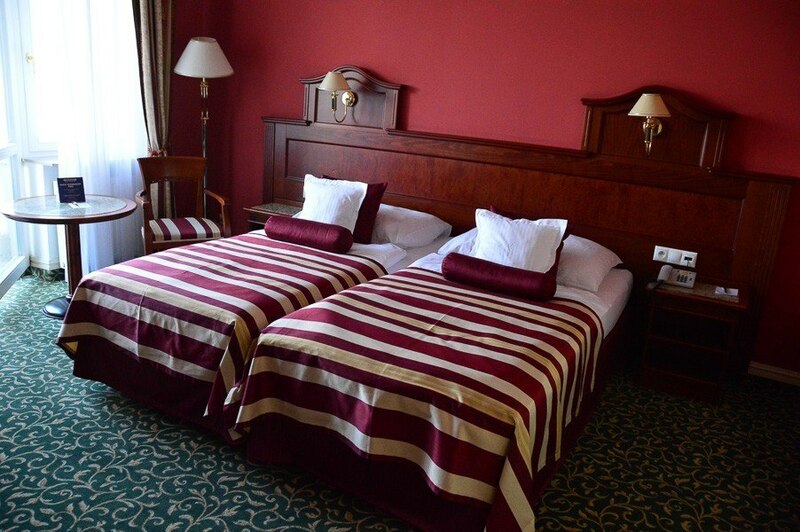 If you are seeking a wellness stay then up to 4 nights is recommended in Karlovy Vary. However, if you are looking for medical remedies then 12 nights is the minimum recommended time to stay. Up to four weeks is ideal. 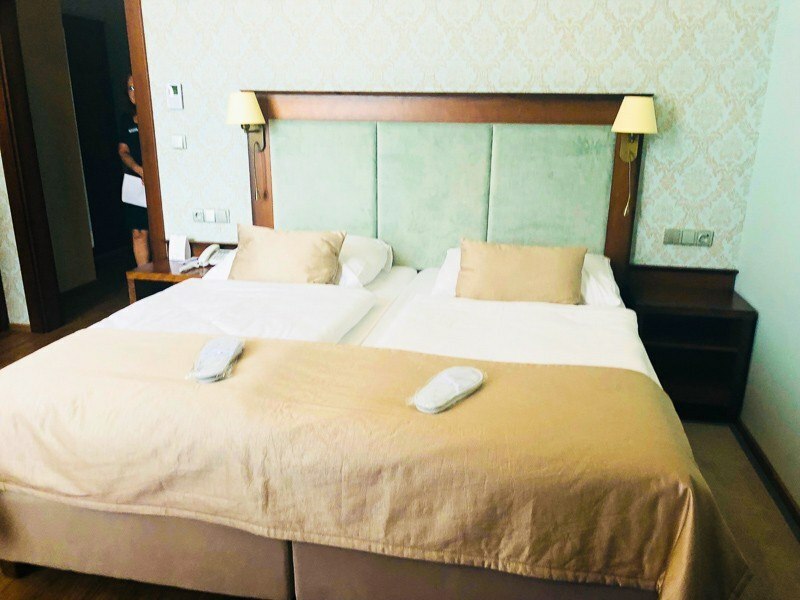 Heading to Karlovy Vary with Kids? 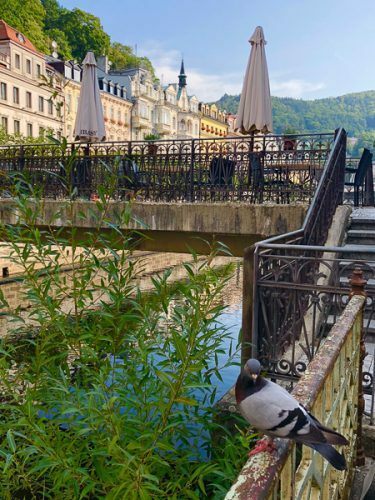 Check out this great post on visiting Karlovy Vary Czech Republic with Kids. 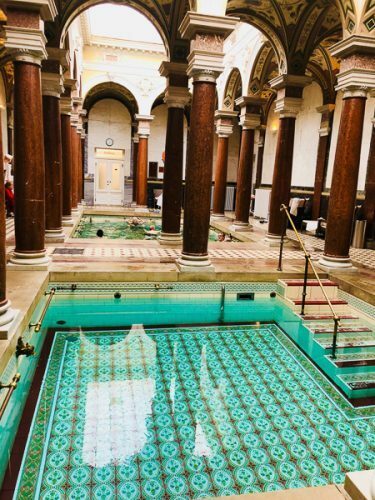 Stroll through the pillars and take the waters! The Mill Colonnade walkway is definitely the place to start your explorations of this beautiful town. You will need a spa cup. These are like a cross between a teacup and a sippy cup. They are available to purchase everywhere! The cups are designed to allow you to comfortably be able to hold the hot water from the springs as well as the small spout for sipping. Essentially the springs are all along the Colonnade. It is designed that you can stop and take a sip from one and then stroll to the next. Each spring is of course clearly marked and identified. To complement your mineral waters try a Karlovy Wafer. These light wafers are usually served with sugar powder and make for a good snack. The Moser Visitor Centre has a glass museum with over 200 pieces and a store for expensive souvenirs! My favourite thing to do in Karlovy Vary was to just wander. This is a beautiful chocolate box of a town and extremely photogenic! Hotel Imperial Karlovy Vary opened in 1912 and is one of the oldest buildings in the Czech Republic. After WW2 the hotel was nationalised and used by the Soviet Union as a sanitorium and managed by the Ministry of Health. High-quality materials are reflected in its marble floor panelling and across its 205 rooms. The most decadent room is the Presidential Suite on the 6th floor. If you were a Russian Grand Prince this is where you stayed. There is also a fantastic breakfast buffet. For another beautiful European region check out my post on the 14 Best Things to do in Tarn et Garonne. The major reason to stay at Hotel Imperial is its amazing spa facilities. 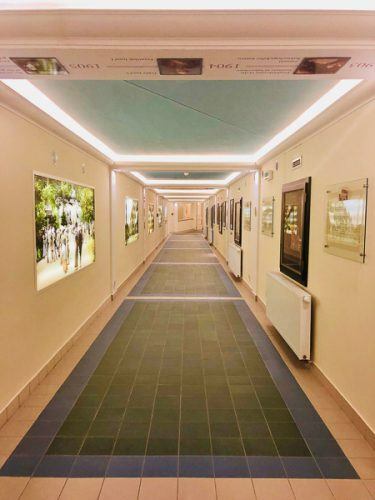 There are several floors devoted to treatment rooms of different types and experts everywhere. 12 of the springs in the area are directly pumped into the hotel. And there is a pool and whirlpools! The Hotel has its own cable car that goes directly down to the city centre of Karlovy Vary and to the Hot Springs. This is the oldest funicular in Europe and dates back to 1903. 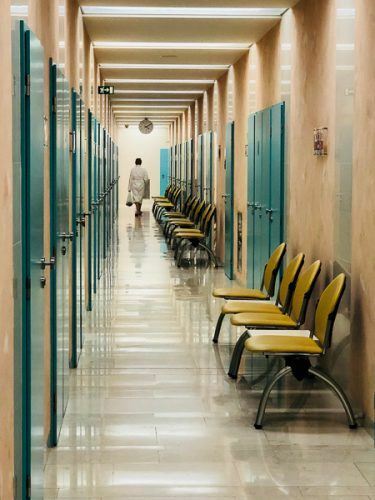 There is a 24 hour assistant, doctors offices and really almost everything you would find in a hospital apart from an operating theatre! Top Photography Tip: Ask at reception if you are able to visit the tower. This is definitely the best place to take photos of the lovely Karlovy Vary. However, it is generally off limits as it is not a place that has been designed for visitors eg lots of stairs and wires. So head there at your own danger! The views from many of the rooms are also very good. 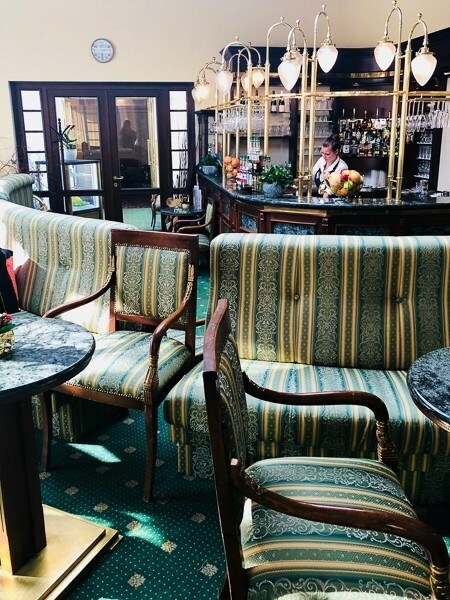 The other amazing place to stay in Karlovy Vary is Grandhotel Pupp. This is a wonderfully decadent top end hotel located in the centre of town. It is a stunning Neo-Baroque building which sits in a small square. It even has its own concert hall! No wonder some of the James Bond film Casino Royale were shot here. Additionally, the hotel has recently opened a new wellness centre with a relaxation pool and sauna. There are also steam baths, an ice fountain, experience showers and a relaxation room. The rooms have top quality furnishings and are very high end. Bathrobe and slippers of course! There are several restaurants and bars in the hotel. They offer an outstanding buffet breakfast! And they even have their own shopping arcade! Restaurant Prague at Hotel Imperial does an outstanding buffet dinner. 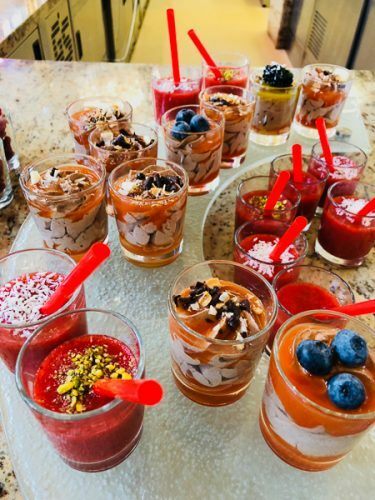 It is relatively healthy but there are also some excellent desserts. 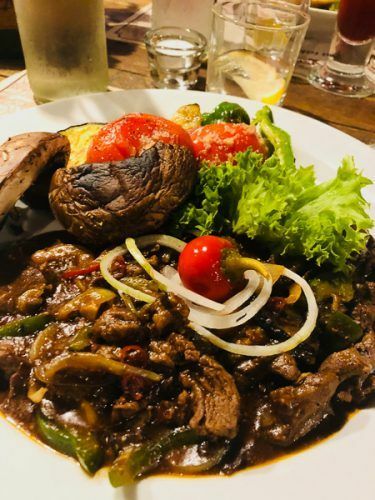 For delicious traditional style Czech food try Becherplatz and Restaurant Karel IV. 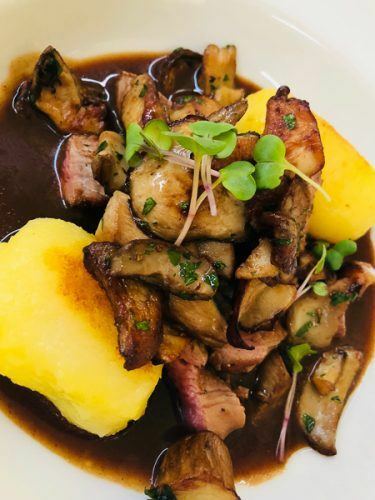 For more modern delicious cuisine try out the lovely Le Marche and its wonderful outside seating area. 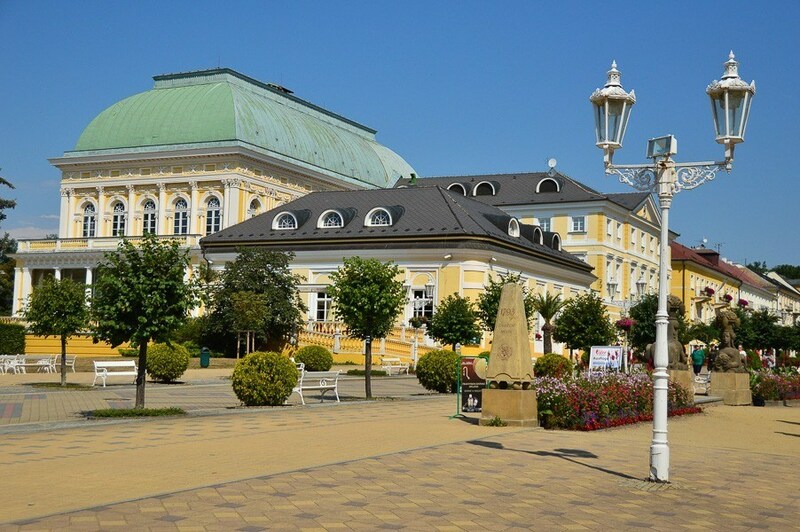 Marianske Lazne was created to be a spa town. Mineral Springs were discovered in the area in the early 1800s. In addition to its amazing variety of spa treatments and experiences, it is also home to a stunning town centre filled with buildings from the first half of the 19th century as well as gorgeous parks. 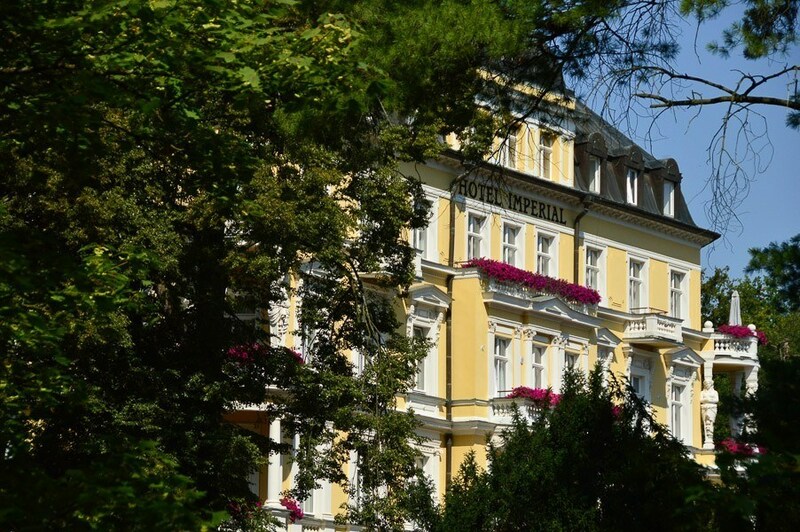 There are 8 hotels in the area that are all owned by the same company – Marienbad Spa Hotels. Each hotel has its own medical team and spa treatments. 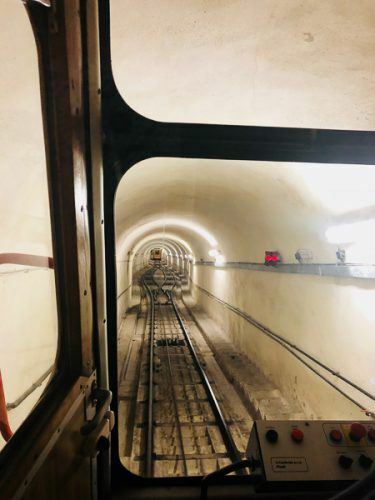 There are underground tunnels that connect all the hotels. As each hotel offers somewhat different treatments guests can easily move between the hotels to ensure they have access to all treatments. Like all the towns in the region, each of the springs has different chemicals and therefore suit different ailments. The Marie Spring CO2 gas is applied in the form of a dry carbon gas bath. It can also be taken as a group in the dry carbonated pool where the gas rises around you whilst you inhale oxygen through your nose. It is possible to see the gas actually rising due to smoke which is added just for effect. It does look fantastic! Peat or mud is also one of the specialities of the region. This is applied as peat packs or wraps. These are used for 20-30 minutes once the mud reaches 40 degrees. The springs are also used for drinking treatments. This on its own can be enough to produce effects when 3/4 of a litre are taken each day. The springs of this area are best known for their treatment of respiratory illnesses and those of the kidneys and urinary tract. The “singing” takes place on the hour every couple of hours. The Neo-Baroque Colonnade is perhaps the best known visual symbol of Marianske Lazne. 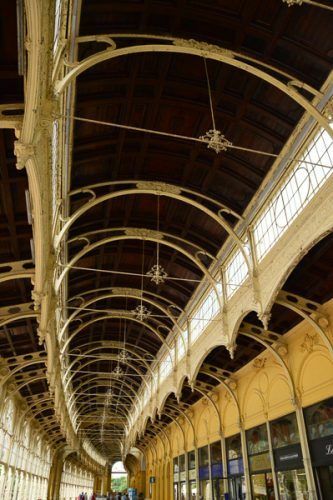 Built between 1888 and 1889 this stunning building allows visitors to promenade between the springs for drinking. Specifically, the Colonnade links the Cross Spring and Karolina Spring. Skalnikovy Sady park dominates the centre of town and is beautifully landscaped and very photogenic! As you might expect this area is also big on aesthetic surgery and treatments such as the laser. One of the biggest and most well reviewed is Asklepion. I stayed at Nove Lazne, the only 5 star hotel of the group. It is located in the centre of town and has 97 rooms. It is also home to quite a bit of history as Edward the 7th was a frequent visitor to this region during his reign. His Royal Cabin is still available to be seen by guests. The rooms are lovely. They are done in soft neutrals with high-quality linen and furnishings. They are also quite spacious and come with tea and coffee facilities. 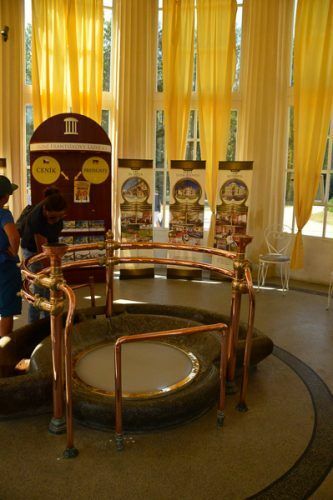 Nove Lazne also has a fantastic Roman Spa with 3 pools, a whirlpool, sauna, steam bath and plunge pool. –Centralni Lazne – receive your spa treatments in unique historic cabins with the original tiling from the 19th century. –Maria Spa – the first place in Europe where peat or mud was used for healing and also the place where the natural CO2 – Maria’s gas emerges. This is what provided the name of the town. 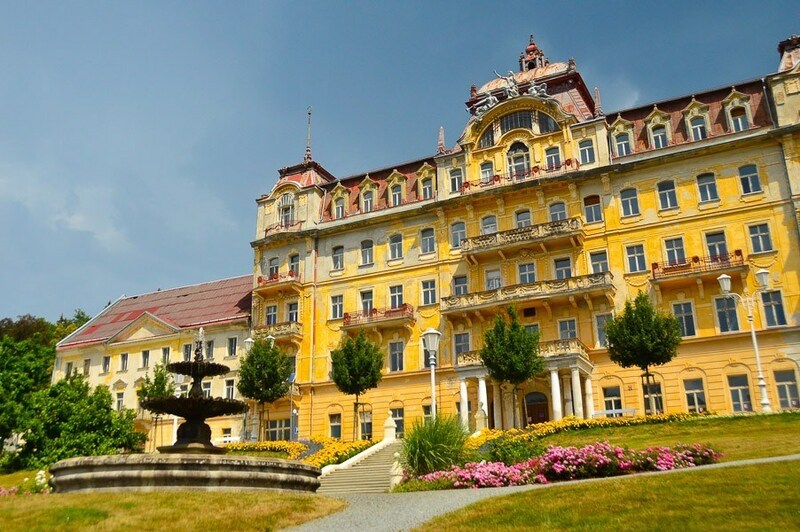 –Pacific – has its own mineral spring and fantastic views of the main street of Marianske Lazne. –Butterfly – a more modern architectural style that works well for families. The hotels are home to some of the best restaurants in the area. Try Restaurant Franz Josef in the Hvezda Hotel or the Restaurant Royal at Nove Lazne. Both have very high-quality buffets. I can particularly recommend the breakfast buffet at Nove Lazne as well as the Lobby Bar. The third and smallest of the Western Bohemian spa triangle is lovely little Frantiskovy Lazne, founded in April 1793. The town centre has been under protection since 1992 and is currently up for inclusion in the UNESCO World Heritage. It is also the only flat town of the spa towns – easier for walking but not as good for views. 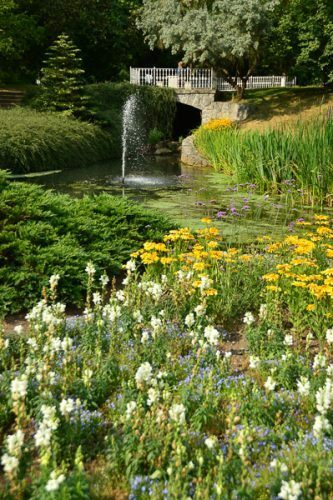 Unlike all the other spa towns, Frantiskovy Lazne only has cool springs – not warm or hot ones. Its waters are particularly good for those with blood and heart issues as well as gynaecological problems. 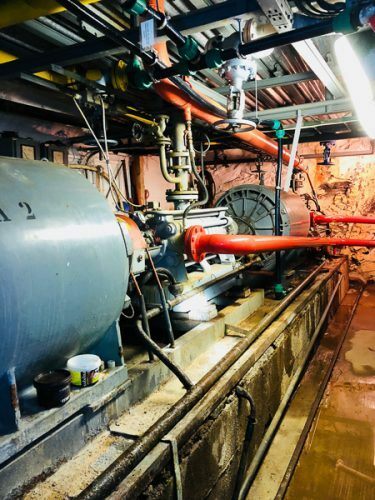 There are 24 mineral springs and 12 in operation. The area is also known for its mud, the first mud spa in the world. The mud of Frantiskovy Lazne has thermal, chemical and mechanical effects. The mud is applied hot to the body. The little town is a mix of neoclassical and Belle Epoque buildings which are all very well maintained. It is a lovely place to stroll. Visit the statue of Little Frantisek. Apparently, if a woman touches a certain part of the statue she is guaranteed to become pregnant! The historic centre of the town is surrounded by English style parks creating a realxing village feel. There is a museum of old cars and motorcycles called the Auto Moto Museum and there is also a huge water park called Aquaforum. This complex includes relaxation pools, swimming pool, outdoor whirlpool, an 82m waterslide, sauna and children’s pool. 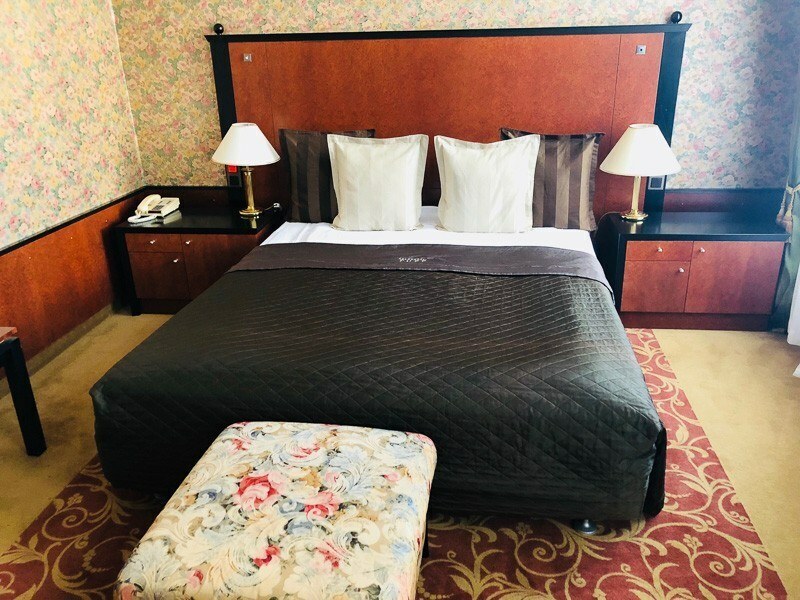 Hotel Imperial is the most luxurious hotel in Frantiskovy Lazne and located in the heart of town. It specialises in treatments which use the natural springs of the area. They have about 50 rooms and a restaurant, lobby and summer terrace. Can you imagine anything more fun than having lunch in a casino hotel that has Chinese carps swimming underneath the floor? Like most of the spa towns, Frantiksovy Lazne has a casino. 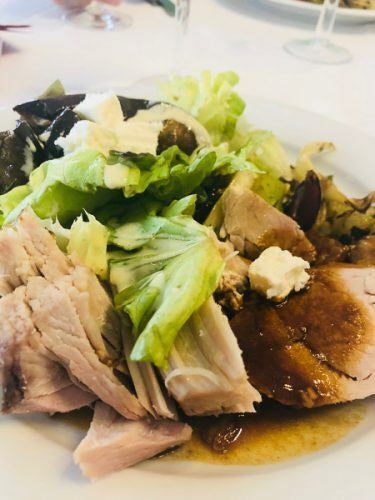 Enjoy a meal at Restaurant Goethe. 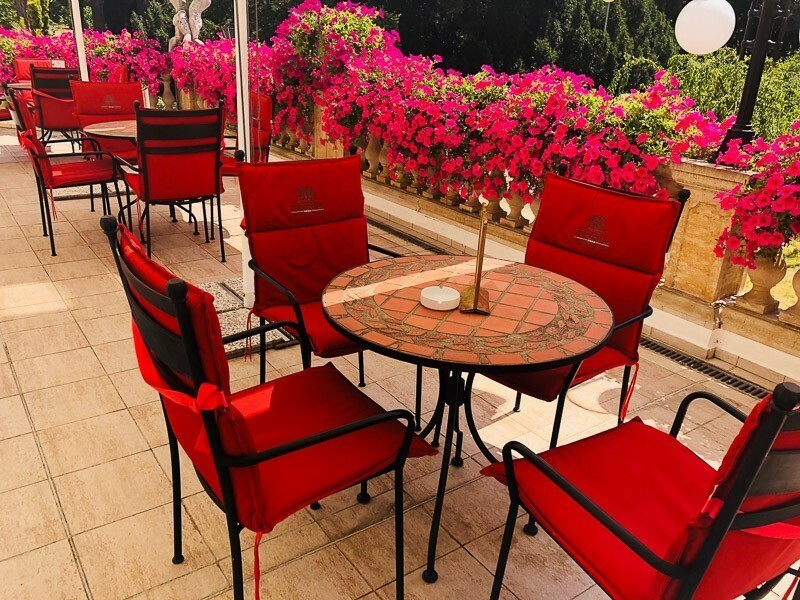 Have a coffee on the balcony at the Hotel Imperial – it is an explosion of pink and open all day for delicious coffee and cakes. After Karlovy Vary, this was my favourite little town in this region. It does not have hot springs so lacks a spa designation but it has a fantastic medieval castle! This ridiculously picturesque town is set on the banks of the Ohre River. 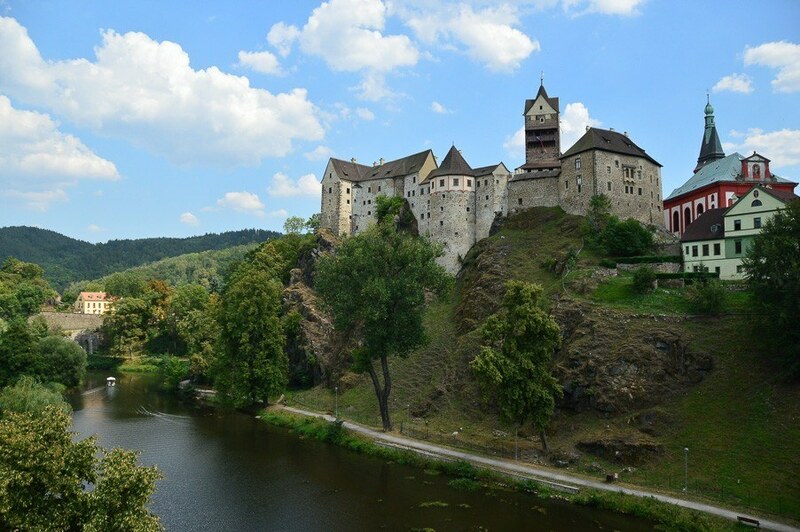 Loket Castle is over 800 years old and one of the oldest castles in the Czech Republic. The castle was formed by two towers, a church and a building. Today it is possible to tour the castle and get some great views. The castle also offers a couple of unusual attractions. 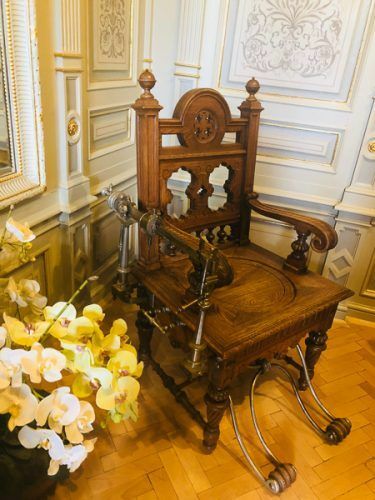 The first is a graphic, multimedia Chamber of Torture museum that quite frankly could give a brave soul some serious nightmares! I have seldom seen anything so gruesome in my travels! If you are into that kind of thing you will be in heaven. If you’re not I suggest that you avoid this part of the tour! Secondly, the castle is the home of a meteorite! This meteorite apparently fell to earth in this area in the 1400s. 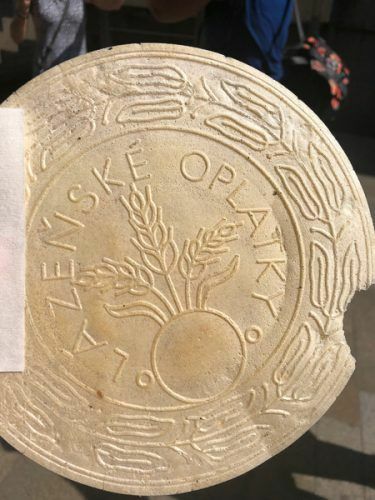 This meteorite is the oldest of 15 that have been found in the Czech Republic. Originally the meteorite weighed over 100 kgs but pieces have been taken over the years for study. The town of Loket is tiny and oh so charming. It will not take long to explore its lovely medieval streets but is well worth doing. Loket played a town in Montenegro in the James Bond film Casino Royale and several scenes were shot in the town. 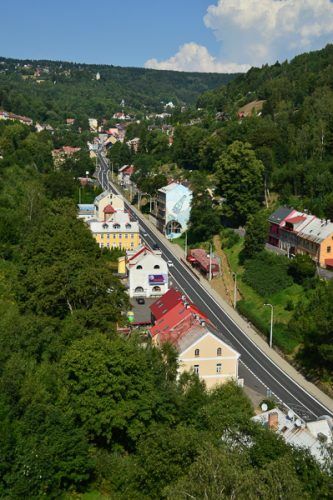 Jachymov is another spa town in the region. It is more well known for winter sports but it is also the home to radon baths. 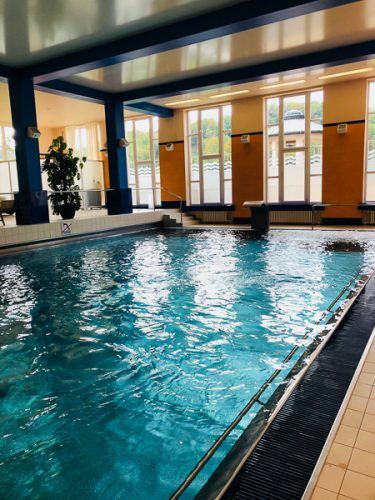 The town has the first Radon Spa and Spa Facilities in the World at the Radium Palace Spa Hotel. The radon-rich mineral water of the area has well-evidenced healing powers. This water is not to be drunk. The prime way to take radon-rich water is through a bath. The water is best suited to those with inflammatory and degenerative diseases as well as skin diseases. However, anyone can have the experience of taking a radon bath! The tub is filled from a pipe underneath the earth to ensure that the radon does not dissipate. The bath lasts 15-20 minutes at a temperature between 35 and 37 degrees Celsius and is quite relaxing. After the bath, you rest on a bed wrapped in a warm blanket for another 15-10 minutes. Of course, just one radon bath will not cure any ails. However, it is fun and relaxing and a rather unique thing to experience! The place to try a radon bath is the Radium Palace Spa Hotel. 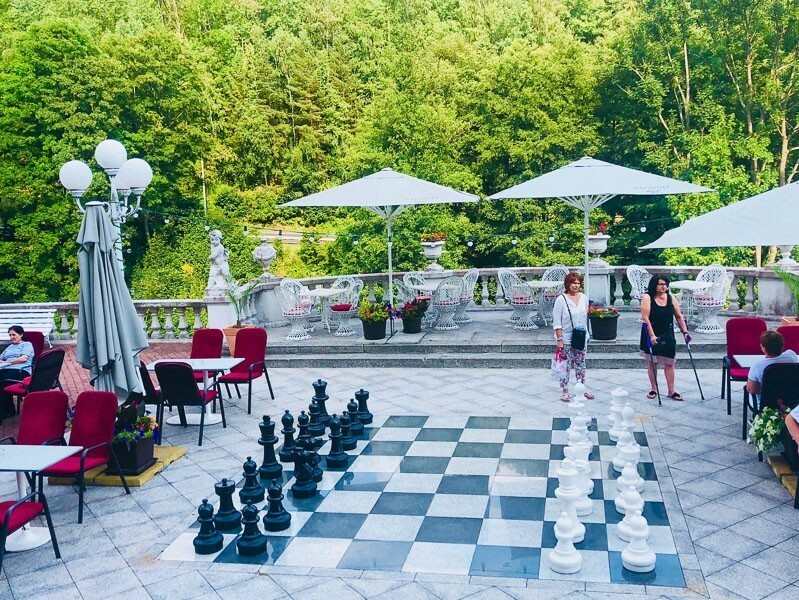 A must do while in this area is having a meal at the fantastic Restaurant Jezirko. 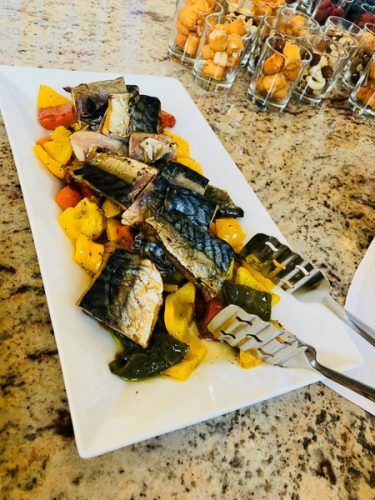 The restaurant is part of a guesthouse and uses all local ingredients – it is home cooking at its best! 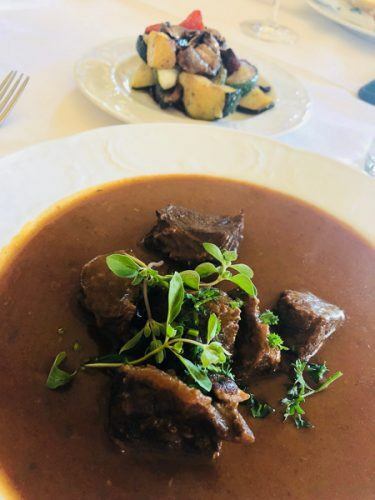 I had their goulash which was absolutely fantastic! Svornost is the oldest operating mine in Europe. As of 2018, it will have been running for 500 years continuously. 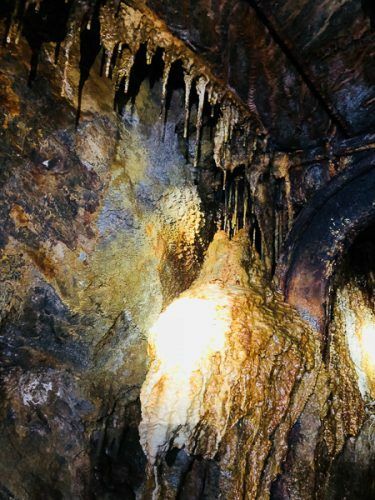 It was first mined in 1518 and last mined in 1955. Over time it was a silver mine and then moved on to uranium. Today the mine is used as the source of the radon springs in the Jachymov Area. The mine is located 500 meters under the earth. It is very interesting to hop in the lift and head down the mine in a tour. It is possible to see where the radon water is coming out of the earth and how it is then pumped up into the town and the spas. The mine is not generally open to the public. However, tours can be organised by special permission through the Radium Palace Spa Hotel in Jachymov. Thanks very much to Visit Czech and helping me to plan and sponsoring my trip to the lovely spa region of the Czech Republic. All opinions contained within this post are my own. What beautiful places. I really didn’t think to explore hot springs in Czech (but it makes sense in relation to nearby countries with similar towns). Sadly my time in Bohemia was terribly short. Thanks for sharing. Looking forward to exploring these one day myself. THanks Anwar – it is a stunning region with lots to do – I highly recommend it!